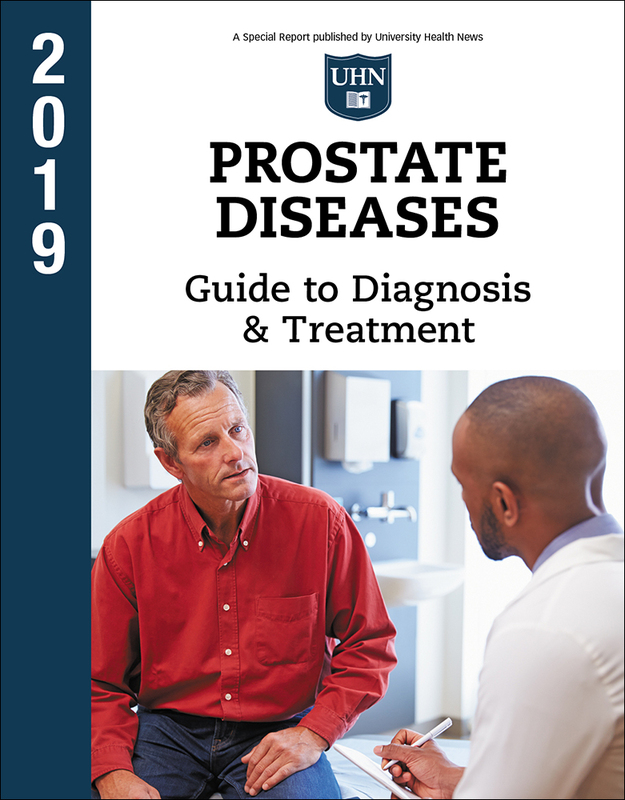 Get the authoritative 2019 report, Prostate Diseases: Guide to Diagnosis and Treatment. You’ll learn lifestyle changes you can make that boost prostate health, while getting the facts about your prostate treatment options. How often do you think about your prostate? But when it comes to the prostate, out of sight, out of mind is a risky strategy. What you don’t know can literally kill you. Boost your prostate IQ with this must-have new report! The prostate gland is notorious for being a troublemaker. Prostate cancer took the lives of nearly 27,000 men in 2017 alone. In fact, 1 in 6 men experience prostate cancer in their lifetimes, making it the second most common male cancer. Even if it doesn’t turn cancerous, your prostate can cause you problems. The prostate often enlarges as a man ages, which can reduce or block the flow of urine—a medical emergency. Or you could get prostatitis, a sometimes painful inflammation of the prostate.! So you see, you can’t afford to ignore your prostate. Fortunately, protecting your prostate just got a lot easier thanks to a new guide, Prostate Diseases: Guide to Diagnosis and Treatment. This is the up-to-date, comprehensive reference you and your family need to take charge of your prostate health. Packed with helpful information, Prostate Diseases explains how you can take steps to safeguard your prostate and reduce your risks of prostate cancer and other conditions. In addition, you’ll discover which foods benefit your prostate—and which ones to avoid. After reading the guide, you might want to think twice about taking certain vitamin supplements. Worried about whether a vasectomy increases prostate risk? Wondering if taking testosterone supplements might be a danger? Prostate Diseases reveals the latest findings. The advantages and disadvantages of the prostate-specific antigen (PSA) blood test. The pros and cons of prostate cancer screening, along with the most recent screening guidelines from major medical institutions. An overview of your treatment options, from “watchful waiting” to surgery. What to consider when deciding on prostate treatments. A look at surgical options to reduce or remove the prostate, including “open,” laparoscopic, and robotic. A review of the latest radiation techniques used to treat prostate cancer. How outcomes from watchful waiting, surgery, and radiation therapies compare. Prostate Diseases briefs you on other prostate treatments as well, including hormone treatments for prostate cancer…cryotherapy (the controlled freezing of the prostate)…chemotherapy…cancer vaccines and immunotherapy…and high-intensity focused ultrasound (HIFU). Benign prostatic hyperplasia (BPH). Even if you are fortunate enough to avoid prostate cancer, you may experience an enlarged prostate, otherwise known as benign prostatic hyperplasia (BPH)—in fact, 90 percent of men in their 80s have BPH. Taking a detailed look at BPH, Prostate Diseases gives you information on the latest medications for BPH as well as herbal remedies that may reduce urinary symptoms. Plus, you get a complete rundown of your surgical options, including minimally invasive techniques. Prostatitis. Another prostate condition you may face is prostatitis, or inflamed prostate. As you’ll learn, this is a noncancerous condition that often has no identifiable cause, although in 5-10 percent of cases there’s a link to bacteria. With Prostate Diseases, you’ll gain an understanding of prostatitis and the most current treatment options. Erectile dysfunction (ED) and urinary incontinence. Last but not least, Prostate Diseases offers helpful insights on two conditions often related to prostate disease and treatment—erectile dysfunction (ED) and urinary incontinence. The guide includes a complete overview of your treatment options, including surgical and nonsurgical approaches. The 2019 edition is available now! Prostate Disease: Guide to Diagnosis and Treatment is available now at the lowest price ever! It’s a small investment that could yield a huge difference for your health. After you receive the book, review and learn from it. If, within 30 days, you are not 100% satisfied with the information in the report, call, write or email us and we’ll gladly refund you your full payment.